Phoenix Snow Park Stand Up for the Olympics Big Show | Phoenix Snow Park Stand Up for the Olympics Big Show | Ecosign Mountain Resort Planners Ltd.
“The Olympics will take place for two weeks, but the ski resort will last more than 20 years. You will experience all the sensations you can feel in the snow on the best course,” said Dave Felius, 53, Canada, a world-renowned authority on freestyle skiing. 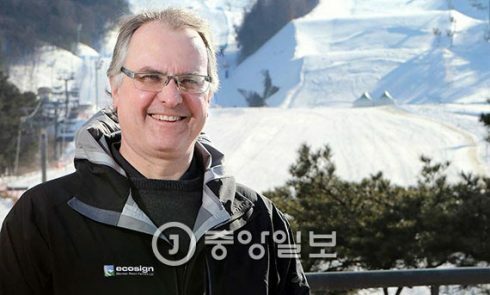 He has 29 years’ experience, and he was responsible for designing the PyeongChang Winter Olympic Ski Course to be held at the Pyeongchang Phoenix Snow Park in Gangwon Province next February. Freestyle skiing and snowboarding are held at Phoenix Snow Park. Snowboard items include: ▶ Parallel Tournament ▶ Half-Pipe ▶ Snowboard Cross ▶ Big Air ▶ Slopestyle. Aerial acrobatics and so on. Ecosign has designed over 400 ski resorts in 41 countries around the world. The ski course design was his dream from childhood. Since 1988, he has worked in Canadian Ecosign, a global ski resort and resort design firm. In Korea, he designed Welly Healy Park in Gangwon Province and the Konjiam Resort Course in Gyeonggi Province. I have already designed the Olympic course four times. He started designing the Salt Lake City course in 2002, Vancouver in 2010, Sochi in 2014 and the Pyeongchang Olympic course in 2014. Felius said, “Phoenix Snow Park is the first ever Olympic event ever made by recycling existing courses.” Asked to design a Phoenix snow park in 2013, he sought six candidates with the goal of making the most of the existing course and minimizing development. Mogul, half pipe, and aerials followed the standards set forth by the International Ski Federation (FIS). On the other hand, the skier-cross, the slope style, and the parallel tournament added artistic elements while following the standards. After the Olympics, I was also worried about post-employment plans. A representative example is the half pipe stadium where the four-day World Cup tournament is held from the 16th. The scale of the course was reduced at the basic civil engineering stage. After the Olympics, ordinary skiers can enjoy the course easily. “If you spray as much snow as possible during the Olympics, you can fit the stadium specification,” Felius said. The Ski Cross Stadium was carefully designed to be used as a mountain bike course from spring to autumn. “The 1988 Calgary Olympic skiing course was built for the Olympics but later turned into a popular course for the general public. I looked forward to winter as well as summer, “he said.